Pinkadots Elementary : Spark Student Motivation Saturday: Realistic Cursive Fun! Spark Student Motivation Saturday: Realistic Cursive Fun! Hello Friends, Today I am linking up with sweet Joanne for her Spark Student Motivation linky. Yesterday, I posted about teaching cursive and my Instagram friends and I had some great conversations about what we use as resources, when we can squeeze it into our busy schedules, and how the kids feel about learning cursive. I was excited to see that many teachers feel strongly that cursive should not be a lost art. It should be taught, practiced, and used throughout school. As we introduce a few letters a week, I am going to be creating, printing, and correcting self made worksheets for the students so they can practice their first and last name in cursive. They were SO excited when I told them about this because the thought of having their own personalized worksheet, was amazing. They cannot WAIT to start. So this weekend, I am typing up worksheets for all of my students. The trick is to always keep one master copy so you do not have to recreate sheets on the computer. First, I found this great worksheet maker online. (Click the image to check the site out!) It's super easy to create and the best part is, it's free. I will have first and last names for each student, but didn't for the picture. The students will trace their names and rewrite it directly below the traced line. Once the students master this skill, we will be moving onto our fun cursive project. I am going to test this out this week with my own name, hang it up in the classroom, and see if any students actually get what it is. 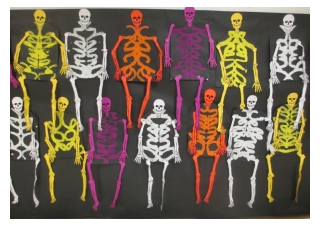 Scholastic put out an awesome tutorial on making cursive/name skeletons. The ribs are actually students' names, using a line of symmetry! These are going to look awesome in the hallway and the students are going to FREAK out when they hear they can use paint in class (meanwhile they will be hitting CCSSs in Writing and Science). Cursive will be the death of me yet! Thank you for the worksheet generator. I love the idea of printing a sheet for each of the kids with their names. I agree that it is important that cursive not become a lost art, but for some of my kids, it is an almost painful experience. Your ideas will help! I also love the idea of creating cursive practice sheets with the students' names. Thank you for sharing this site! Those skeletons look so fun! I must try that. Thank you! I just found your blog! I am so excited and a new follower!! I love the skeletons! Very informative blog. I really like the idea of creating cursive practice sheets with student’s names. 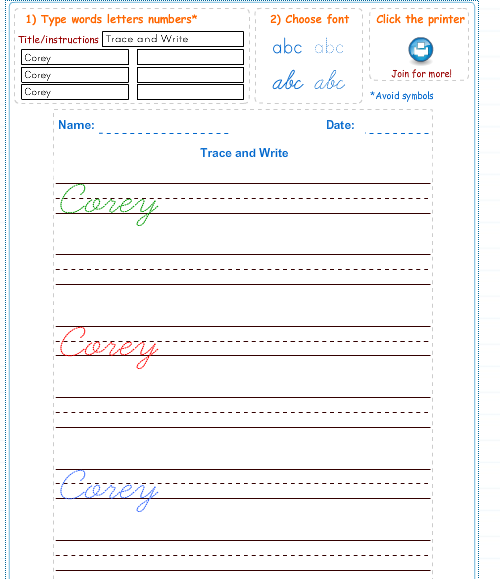 Cursive handwriting worksheets help for writing cursive letters, words and sentences. Cursive practice sheet is a very interesting and innovative way to writing words and sentences.